2012 saw the start of another 3 year jersey cycle and yet another jersey redesign by the Warriors. For the first time since 2003 the jersey had chevrons (V's). 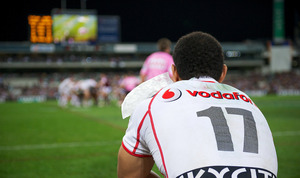 Warriors wore this jersey in their first game of the season at Eden Park in a replay of the previous years Grand Final. The away jersey doesnt get sold online as often as the home jersey and most I have seen are too stained to be worth anything. 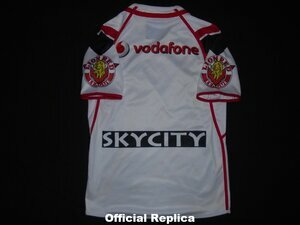 PLAYERS JERSEY - Same as the official replica but tapered and a black number on the back. Number had small pin holes on it all over. Assuming that was to improve the breathability of the jersey. Theres an excellent picture in the image gallery that shows the holes well.